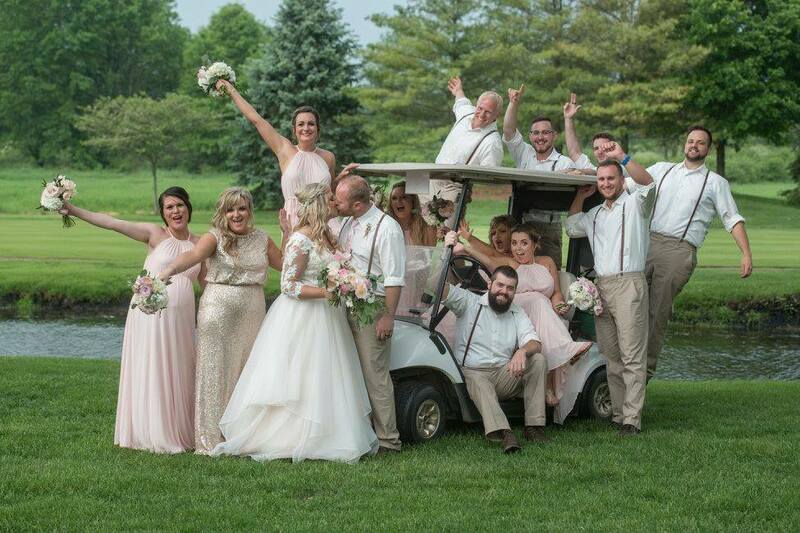 Everyone had a blast at this May 2018 outdoor wedding at Sable Creek Golf Course in Hartville, near Canton & Akron, Ohio. 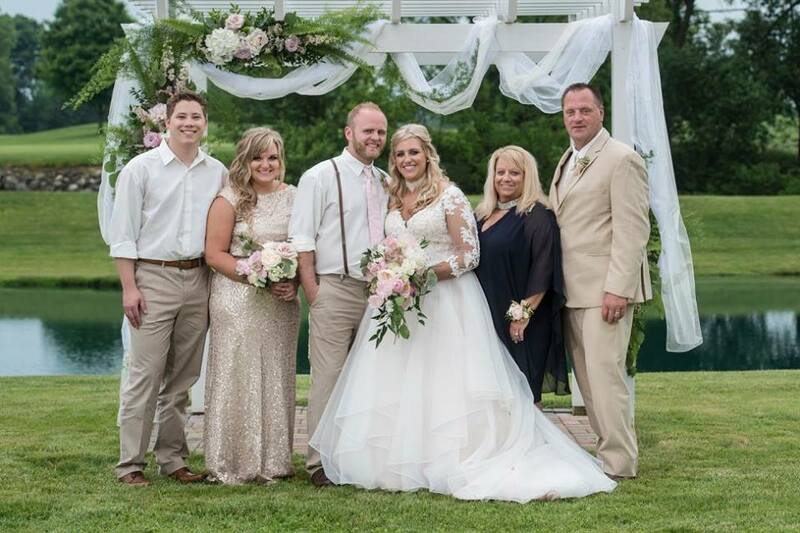 Can you tell it rained all day and all night? 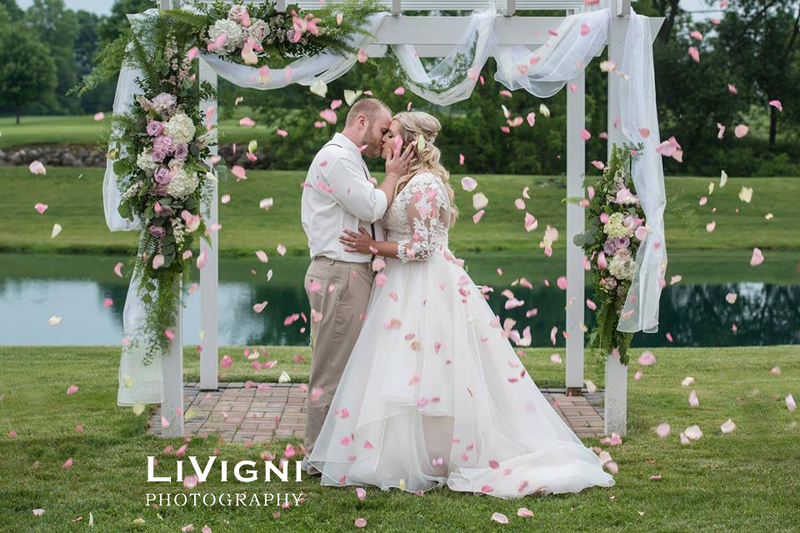 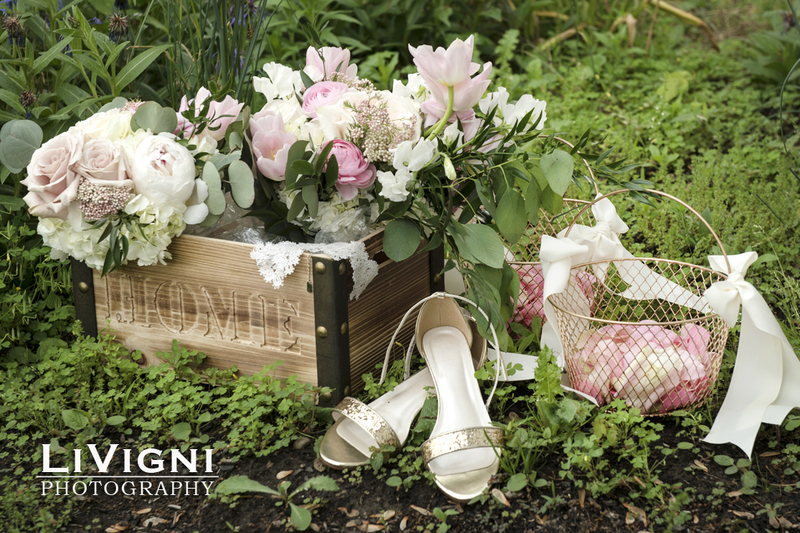 Well, it stopped raining just long enough for the wedding ceremony and for Livigni Photography to grab these great shots of all the fun. 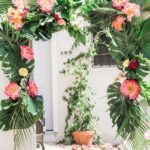 No one’s spirits were dampened by the rain; joy, love, and faith were evident throughout the festivities. 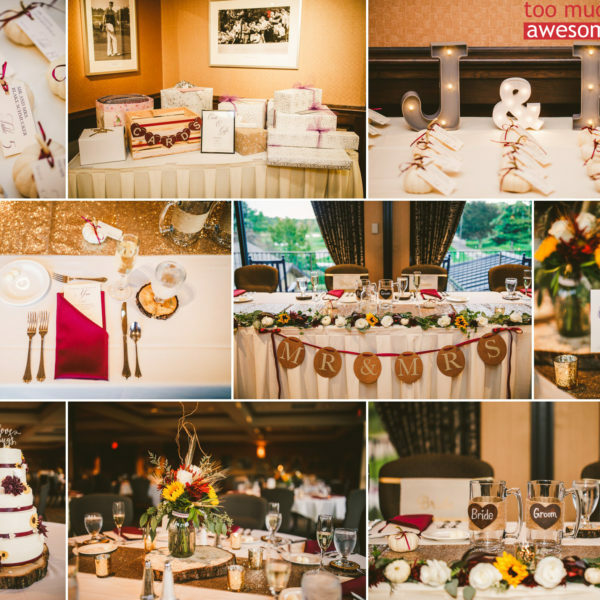 The wedding feel was romantic, elegant, and fresh with a blush, white, and gold color scheme. 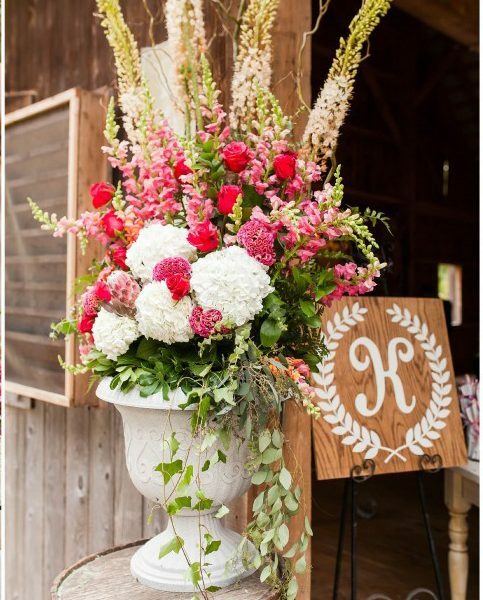 It took place under a white pergola swagged with chiffon drapery and accented with lush flowers. 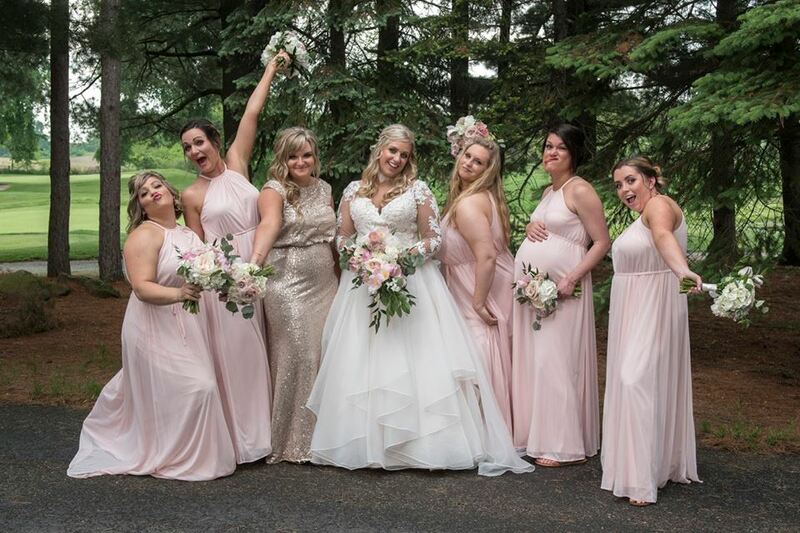 The bridesmaids wore blush chiffon gowns, with the exception of the bride’s sister and matron of honor. 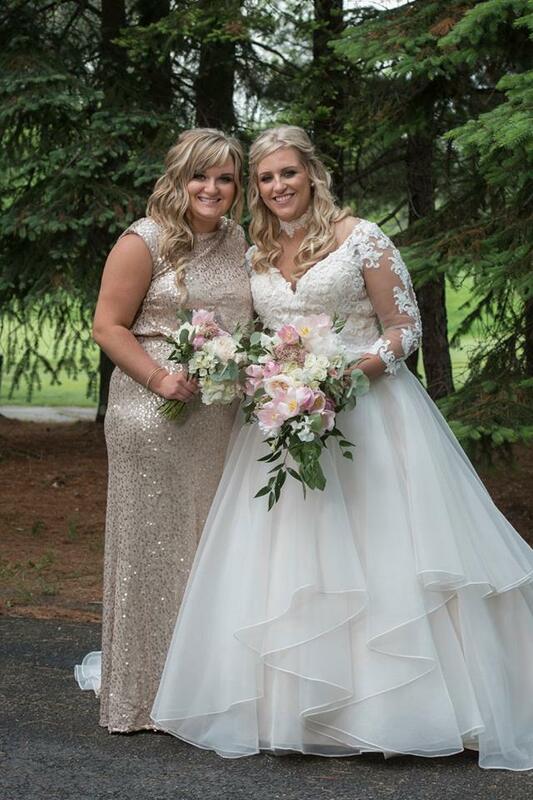 She wore a sleek, rose-gold, sequined sheath. 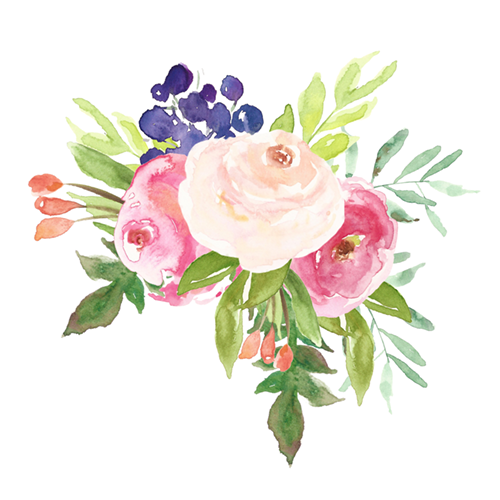 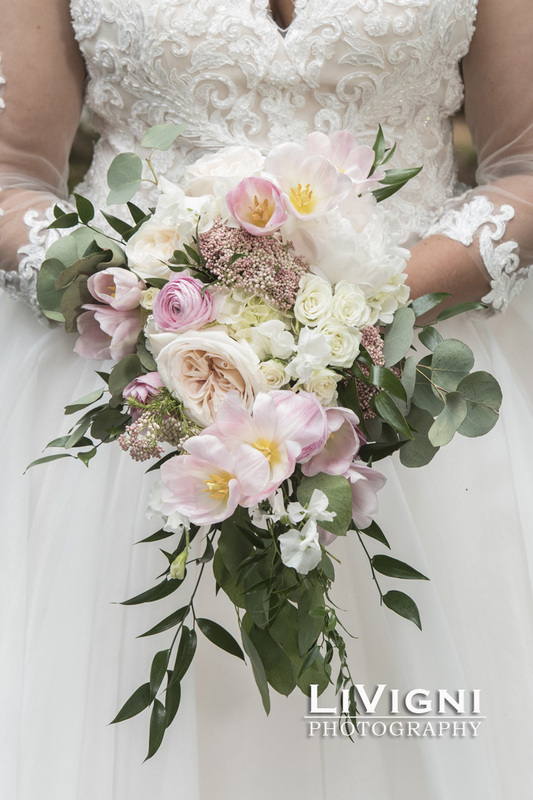 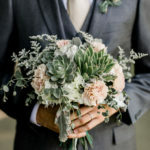 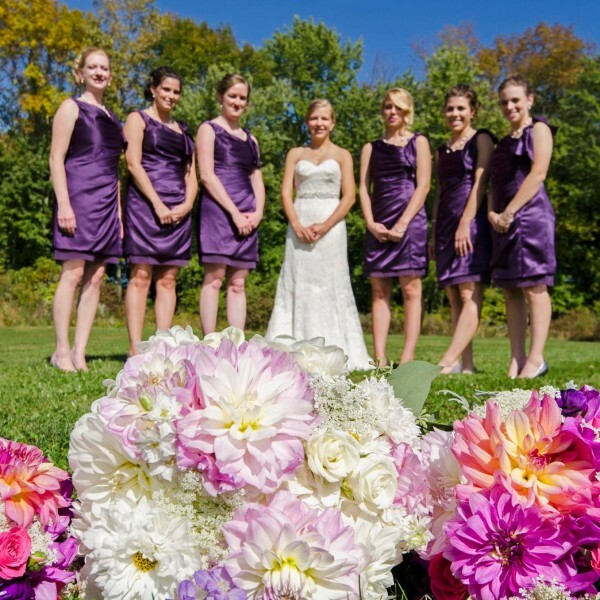 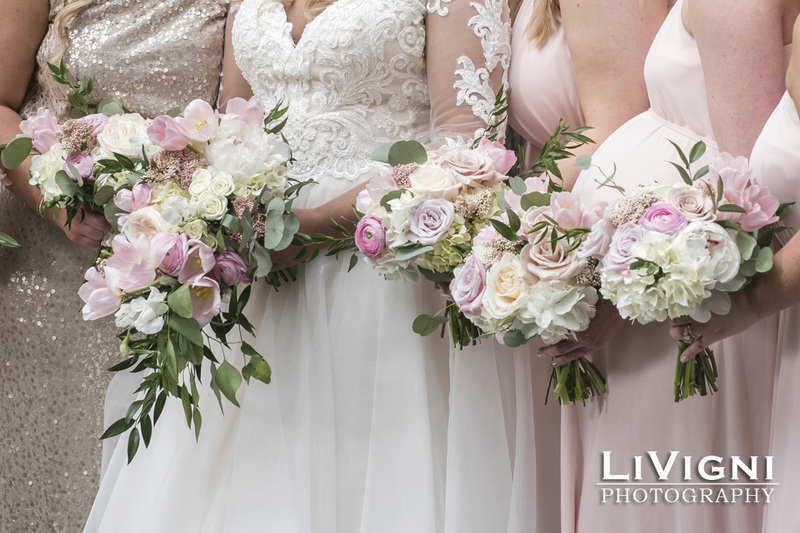 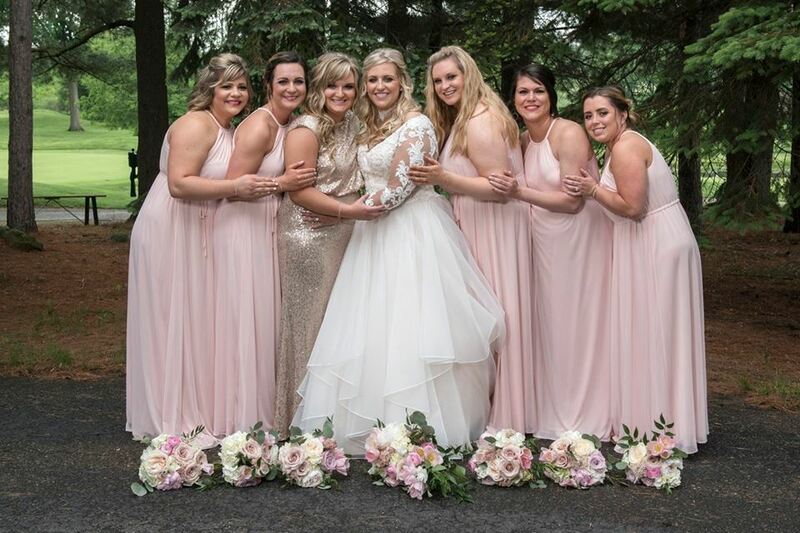 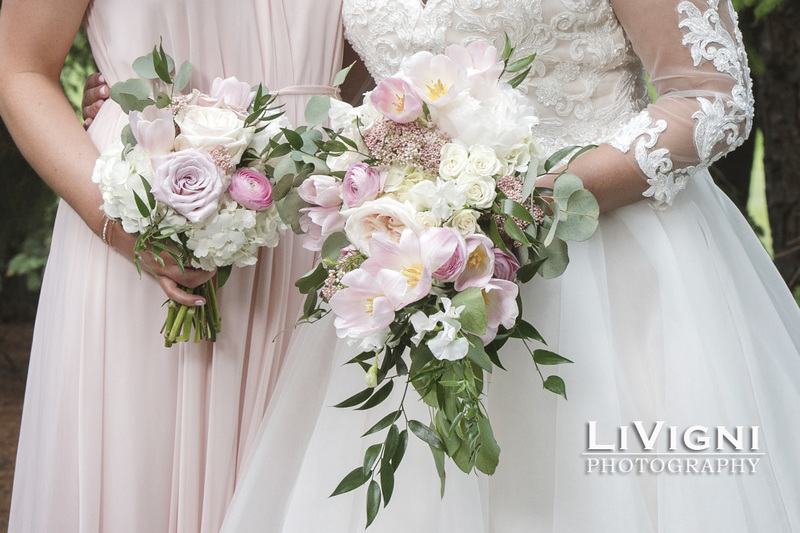 The bridal bouquet was a cascading confection of blush and white peonies, O’Hara garden roses, ranunculus, riceflower, and tulips while the bridesmaids carried hand-tied bouquets of the same. 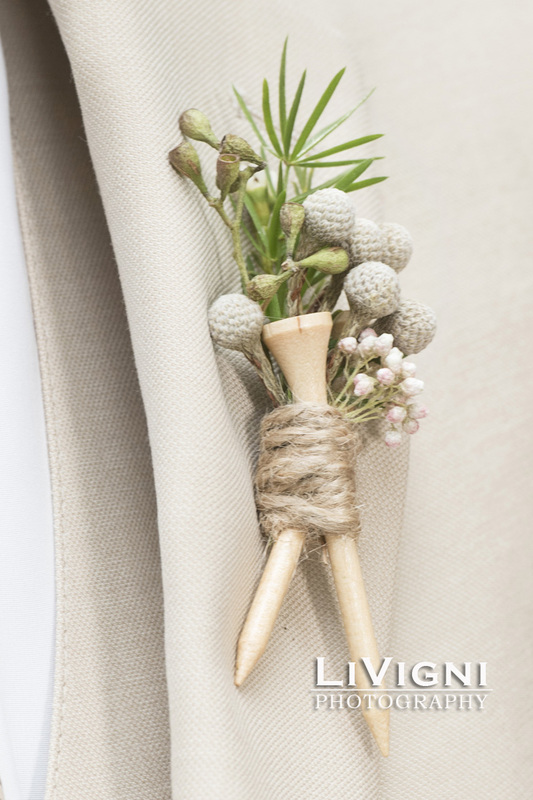 The golf theme was evidenced throughout the wedding including the golf tee boutonnieres worn by the men of the wedding party. 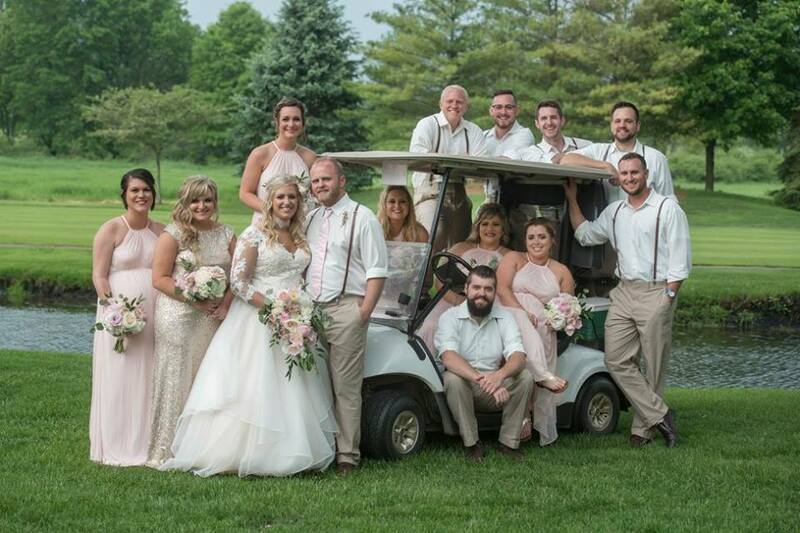 It was almost as if they kept the tees they had used in the pre-wedding golf outing and tucked them into their lapels. 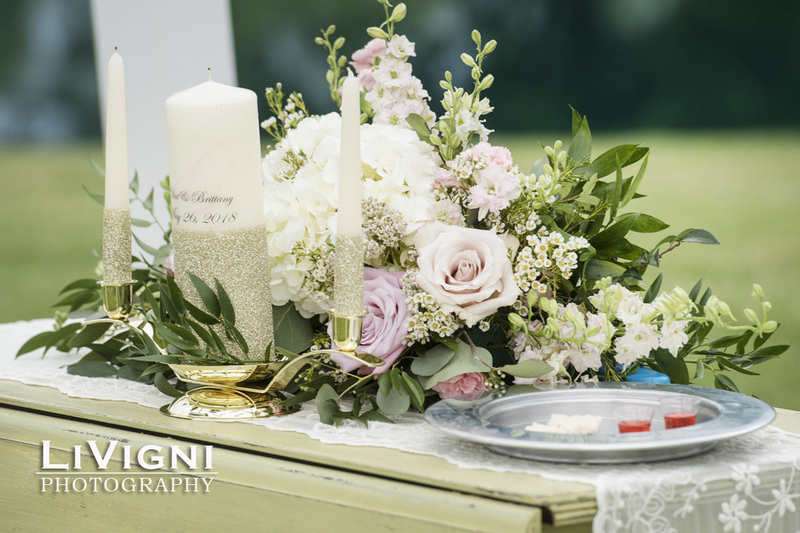 The addition of silver brunia berries looked almost like tiny golf balls. 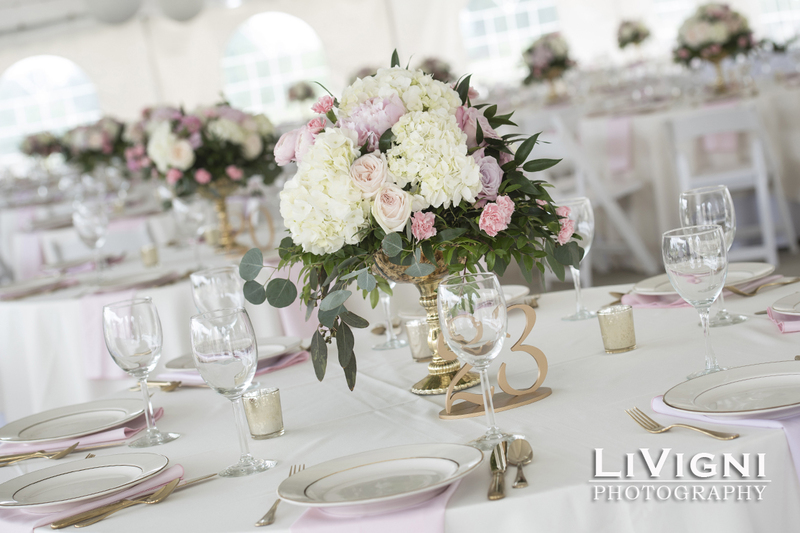 The reception under the expansive white tent of Sable Creek was the epitome of elegance with white and ivory linens, gold flatware, and gold-rimmed china. 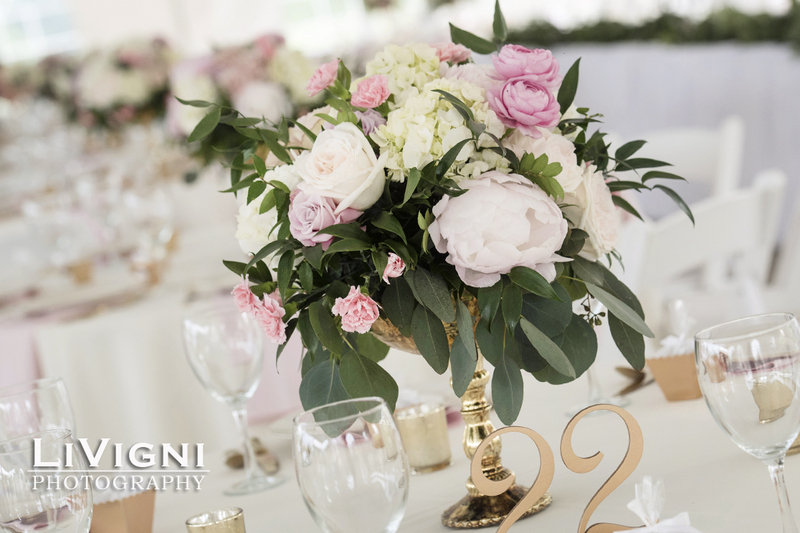 Each table displayed a gold compote centerpiece overflowing with peonies, garden roses, hydrangea, and ranunculus. 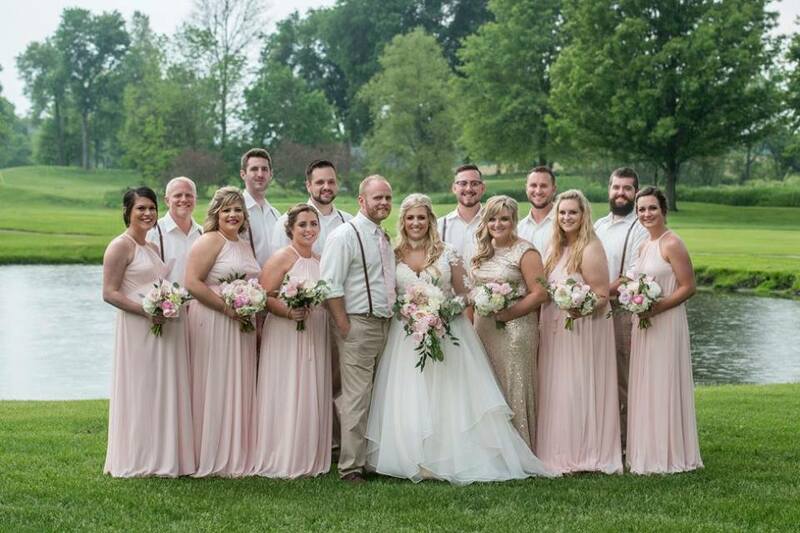 All was not stiff formality however as the guests enjoyed a variety of salsas, chips, and crudites followed by a buffet of southwestern specialties by Mi Casa of Hartville. 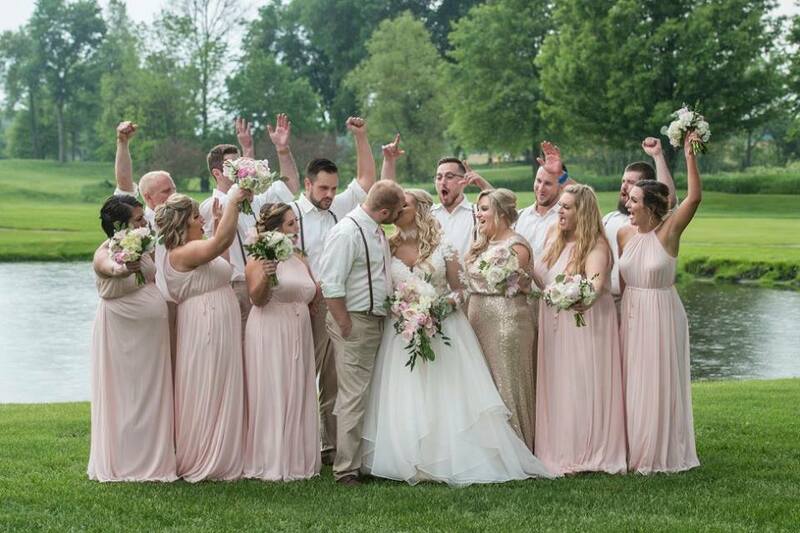 Dancing followed a special performance by the bride and her dad that amazed everyone.